Renowned philanthropist, generous persona, humanitarian leader, blessing to many, compassionate soul ABDUL SATTAR EDHI demise is an immense loss to Pakistani society. The legendary Pakistani social worker was diagnosed with kidney failure three years ago and was unable to receive a transplant due to deteriorating health condition passed away on Friday 8th July 2016. The man who rejuvenated and lived for welfare of people. EDHI in itself is a name relinquished for the sake of well being and goodness to others who built a charitable empire out of nothing and his philanthropic love is no hidden. EDHI, an inspiring national hero, Pakistan’s largest charitable organization mastermind death is surely a loss to the society. He will always be remembered as dedicated soulful personality who rendered utmost services for betterment of those who cannot help themselves. His prominent contributions to orphanages, ambulance services, maternity wards, morgues, shelters for elderly, nursing homes, rehabilitation centers all speak for the humbleness and love for humanity this man possessed. Accolade with Nishan-e -Imtiaz, EDHI has won hearts of millions with his un-matchable services for the well being of Pakistan society. 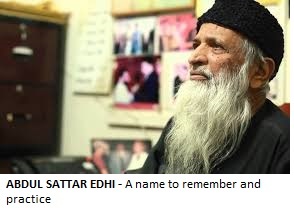 Owner of EDHI foundation, operating for around six decades his services will always be mesmerized. “Social welfare was my vocation, I had to free it,” he says in his autobiography, ‘A Mirror to the Blind’. Sparsely equipped EDHI has won hearts of all and deserves all the compassion and respect for his spirit and remarkable service to mankind. Highest respect to selflessness and humility but unfortunately the country is unable to recognize and acknowledge the true devotion. Throughout the history ABDUL SATTAR EDHI has been constant with providing relief to the nation’s poor net. A national hero and blessing in disguise to the needed. His only aim was to bring comfort to lives and he has been commendable in it. Any award would have been less to honor such an incomparable personality and his love/dedication for mankind. Bigger than any award and did not mind begging for the great cause A reason to believe in humanity and a symbol of hope, ABDUL SATTAR EDHI will always be remembered as priceless treasure. “He wished to be buried in the same clothes he used to wear. 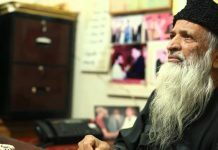 He also wanted to donate his body parts, but only his cornea can be donated as rest of the organs were not in healthy condition,” This speaks volumes for EDHI Shahab submissive love for humanity. The world will always cherish richest poorest Man – EDHI whose humanitarian love was his power. Owner of largest ambulance network was true to his work and dedicated all his energy to humanity. “At the camps where the migrants had arrived, people were dying of diseases. There were dead bodies lying on the streets. I had to do something, so I buried the bodies, asked people for money and bought medicines for the sick,” says EDHI. His deep words clearly highlight his profound love and attachment to people and help. ABDUL SATTAR EDHI, the obstinately humble hero of Pakistan turning point to philanthropy was state’s failure to provide his mother care. The state and the leaders need to realize that lives of a common man are priceless and we cannot handle more damage to society. EDHI is an exemplary example who lived for humanity. A loss to humanity is a loss of nation, loss of mankind, loss of hope, loss of feelings. No religion is greater than HUMANITY and this is the message this man left behind. Respect the ideology and work of ABDUL SATTAR EDHI and Pakistan has lost another great soul. His words, actions will always be remembered and nobody can replace the true spirit and zeal of this man. Computer Engineer by Profession and has a love for writing. He was a force of integration. He found ecstasy in smiles of orphans and down-trodden.